Derek Sheils leads the Grand Final at the Skerries 100 on Saturday. Derek Sheils underlined his dominance on the Cookstown B.E. Racing Suzuki at the Irish National road races this season with a big bike treble at the Skerries 100 on Saturday. Sheils began the year with victory on the GSX-R1000 Suzuki at the Tandragee 100 before completing a double at Cookstown prior to the North West 200. Derek McGee leads Michael Sweeney at the Skerries 100. As the Irish season resumed in earnest once more following the Isle of Man TT, Sheils stole the show at his home event in North County Dublin. The organising Loughshinny Club managed to run the feature Grand Final despite the threat of rain after the initial attempt was halted. Held over seven laps of the 2.9-mile Skerries course, Sheils – who started from pole – took the race by the scruff of the neck as he surged into the lead. The Dublin man set a hot pace as he established a commanding advantage over Derek McGee and Michael Sweeney and was able to slacken off on the final lap, coasting home to win by 10 seconds. 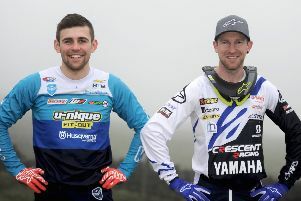 McGee narrowly held off Sweeney, while impressive newcomer Davey Todd – who normally competes in the British Superstock class – finished in fourth ahead of Davy Morgan and Graham Kennedy. Earlier, Sheils won the first race on the programme to extend his lead in the Irish Superbike Championship with another sublime ride in the Open Championship race. He dominated on the big Suzuki to win by 17 seconds from McGee, who only just denied Sweeney for the runner-up spot. Saintfield rider Morgan was fourth on his Kawasaki followed by Todd and Magherafelt man Paul Jordan (Evolution Camping BMW). Sheils also trounced his rivals in the non championship Open race, which he won by 22.2 seconds from Sweeney, who was a safe second ahead of Jordan. A blistering Supersport race went down to the wire as Sheils, McGee and Sweeney fought it out around the narrow country roads at Skerries. McGee had his nose in front for most of the race but Sheils was playing a waiting game and made his move to hit the front on the final lap. McGee, though, was in no mood to throw in the towel and he fought back on the run to line, prevailing at the flag by only 0.012s with Sweeney 0.6s behind in third. Sheils had been leading the Supertwins race in the final event of the day but failed to finish, leaving McGee and Sweeney to battle it out. In another nip and tuck contest, McGee got the nod by 0.109s, with Paul Jordan completing the top three, 7.7 seconds adrift in third. McGee also won the 125GP/Moto3 race to make it a hat-trick, beating Gary Dunlop with Nigel Moore in third.